$16.00 & FREE Shipping on orders over $59. 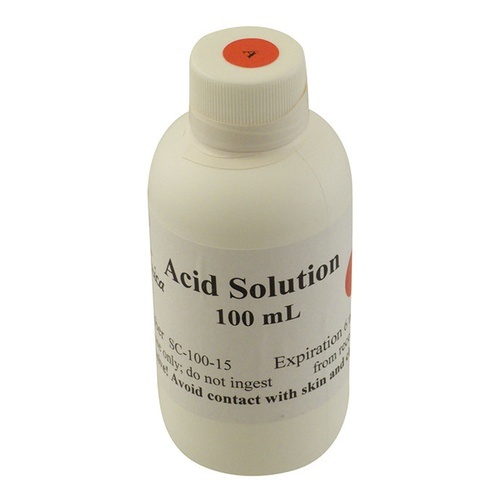 Replenishes the SO2 Acid Reagent for the SC-100 and SC-300 kits. Good for up to 50 tests. Guaranteed for 6 months. To avoid cross-contamination with other reagents, use a dedicated pipette to dispense the acid reagent. Store reagents in a dark, cool place with the bottle tightly sealed to maximize shelf life. Note: The Acid Solution is not available for International Customers because it is treated as a Hazardous Material (it is possible to ship to Canada but it is nearly a US$ 70 extra shipping charge). Vinmetrica has distributors in Europe and in Canada. We recommend that international customers contact Vinmetrica directly for assistance finding a local distributor. Essential product for the Vinmetrica system. I got the larger portion as I am counting on a 2 year shelf like when stored in a wine room cabinet- dark and cool.